Swordfish is a large migratory fish that is found in oceans all around the world. Its name comes from the flat sword shaped bill projecting like a long nose from between its eyes. Swordfish are quite predatory, so the taste of the meat will vary by location and by what they are mainly snacking on. The flesh is dense, making it the perfect fish for holding up well when grilled. Like most fish, swordfish cooks quickly on a Foreman Grill. There is a fair amount of fat in the flesh, so it will stay moist when grilling. The fat is mostly mono and polyunsaturated that is actually good for your heart. Swordfish is also carbohydrate free, making it a popular item on a low-carb, high protein diet menu. Let’s explore a couple to ways to grill swordfish. The less you do to swordfish the better. It is a very tasty fish all by itself. You can easily just grill it on your Foreman Grill by brushing a little butter on the hot grill plates, placing the fish inside, closing the top, and letting it go for 5 minutes. Then, just hit the cooked fish with a little salt and pepper, and a squeeze of lemon juice. The recipe included here is still very basic. However, it has some fresh herbs and garlic to brighten up the flavor a bit. The recipe following the fish recipe is for grilled asparagus to go along with the main attraction. Swordfish tends to pair really well with bright and super fresh spring vegetables because it is so hardy on its own. You can make the asparagus first and serve it at room temperature. Both of these recipes work well on pretty much any Foreman Grill with top and bottom grill plates. Feel free to adjust the recipe amounts according to the size of the crowd you will be feeding. With both of these recipes you may have to work in batches depending on the size of your grill. You can always loosely tent some foil over cooked fish to keep it warm. 1. Heat the Foreman Grill to medium high. 2. Whisk together the oil, lemon juice, mint, basil, and garlic in a medium bowl. Add salt and pepper to taste. 3. Brush the swordfish steaks with some of the lemon, EVOO, and herb mixture. Grill the steaks until just cooked through with the top closed for approximately 5 minutes. Transfer the steaks to plates and spoon the rest of the herb mixture over each. Serve with spring vegetables. 1. Preheat your Foreman Grill on high. 2. Cut the woody ends off of the asparagus and place in a sealable plastic bag with olive oil, garlic, salt and pepper. Coat the asparagus well. 3. Grill for 5 or 6 minutes until the asparagus is slightly tender but still crisp (timing will depend on thickness of spears). 4. Arrange on a plate with your protein and grate the fresh lemon peel over the top. If asparagus isn’t in season, try fresh green beans, broccoli rabe, or thickly cut zucchini rounds seasoned and grilled the same way. If you are a wine drinker, a rich chardonnay is a perfect accompaniment to this meal. Do you look forward to grilling season? It is such a favorite pastime that it is hard to wait for warm summer evenings to fire up the charcoal or gas grill. Anticipation starts to take hold early spring each year when the first green vegetables begin to show up in markets. That is a signal that it’s time to plug in the George Foreman Grill and get a jump on summer grilling. Meats and waffles have been taking up most of the indoor grill space over the winter. What I am craving is fresh fish and vegetables. A Foreman grill is great for both of these. The fish doesn’t stick to the grill, nor does it dry out. And, the vegetables don’t go rolling off into hot coals and ash, forever lost. 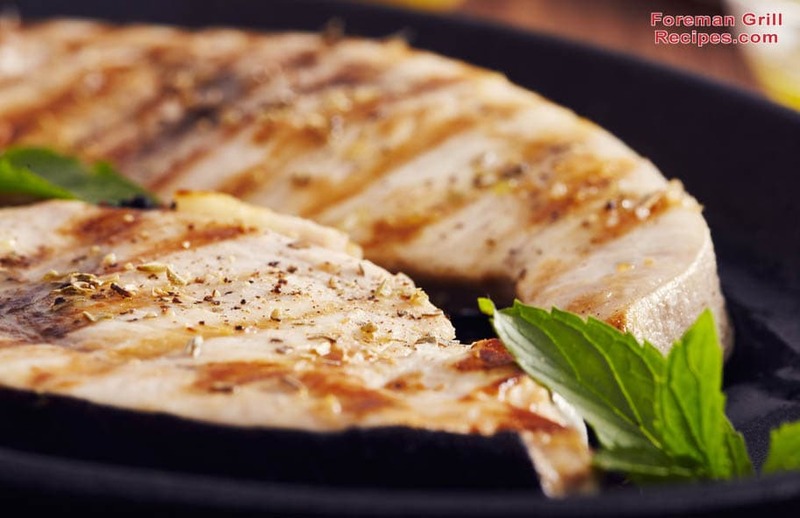 If you are aching to get back to grilling lighter proteins and extremely fresh produce before the weather is awesome, take advantage of your Foreman Grill and get a head start on the season by grilling swordfish and veggies indoors. These recipes just make it so easy. Mr Foreman is one of the nicest men on this planet and anything with his name attached to it has to be good. I am 65 and have followed him forever and still hope to meet him one day if God grants it. The Swordfish should be rubbed with a fresh piece of ginger as it gives it taste of the Caribbean.